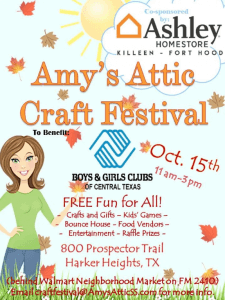 Amy’s Attic 4th Craft Festival is partnering with Ashley HomeStore to raise funds for the Boys and Girls Clubs of Central Texas to help support their work with our communities’ youth. Please join us on October 15, 2016 for our 4th Craft Festival where you’ll find more than 50 artists and vendors, yummy food options, FREE inflatables and fun for the kiddos, plus so much more! For more information or for an application to be a vendor, please email craftfestival@amysatticss.com or call (254)547-9629. We can’t wait to see you there!